The shooting in an Orlando nightclub that left 50 people dead is now the single most deadly shooting in the United States’ history. This was a heinous act of violence fueled by hatred and intolerance, and is one that should not have happened. It is deeply saddening to me to think about the lives lost, the family members who must carry on, and that someone could have ever thought taking innocent lives was the solution to their problem. It is something I really cannot begin to grasp. As is always the case after a tragedy such as this one, we will hear every detail of this horrific event in the coming weeks. Our politicians, our thought leaders, and our religious leaders will all weigh in heavily on the subject. They will talk about gun violence and terrorism, but in doing so, they will be skimming the surface of the real problems that are occurring. Gun violence is a symptom. Terrorism is a symptom. Regardless of the stance you take on these issues, addressing them will only cover the symptoms and not the underlying causes, which are far more deeply rooted. To understand the root cause of these problem, one must ask “why?” When you ask why enough times, you begin to realize that the bulk of these problems, including the Orlando shooting, break down into education, cultural norms, and fear driven by a lack of understanding. These issues run deep and are extremely challenging to overcome, but I don’t think it’s impossible. I think to solve these, we have to look beyond our leaders to our society as a whole. I’ve blogged about social entrepreneurs before, and how they seek to find innovative solutions to society’s most pressing problems. I believe we need to look to the solutions they are proposing and within ourselves to get the conversation going about how we can address causes instead of symptoms. We should be looking to the people that are shaping younger generations to create new cultural norms, and working to break down barriers of intolerance. These are people trying to address the fundamental misunderstanding of using violence to solve problems. If we wait solely on our political, religious, and thought leaders, these changes will never happen in our lifetime. Addressing these causes is something that happens over a generational span, as that is what is necessary to impact cultural norms. So if we ever want to see a real systemic change, we should instead be looking to what our social entrepreneurs are doing today to make a difference. Just my two cents. Were you impacted by the shooting in Orlando? 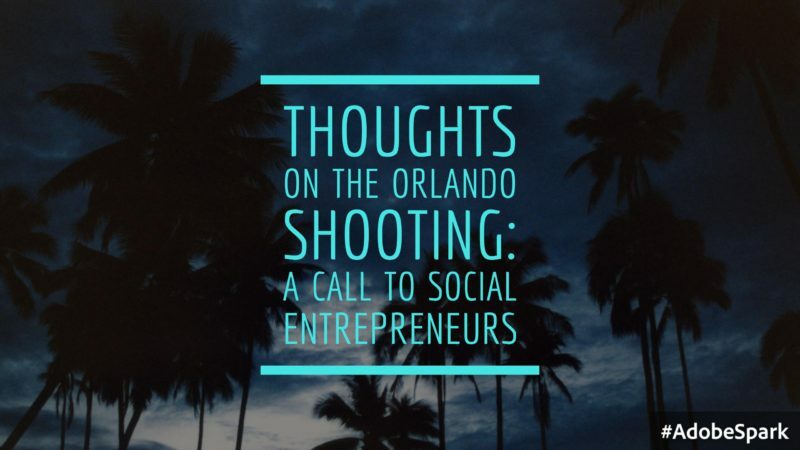 Do you believe social entrepreneurs have a place in fixing these kinds of problems? I would love to hear from you in the comments below.